Recently on one of my Microsoft Dynamics CRM projects – we want to clean-up the various Teams/Business Units created over the years that are no longer relevant. However – some Teams such as the default Teams are more challenging to delete due to the following reason – The default business unit team cannot be deleted. Team Delete Error. The default business unit team cannot be deleted. The name and membership for default team are inherited from their parent business unit. The only way to remove a default team is to remove the team’s parent business unit. Deleting a Microsoft Dynamics CRM Business Unit in CRM 2011 and later is pretty straight forward per this earlier blog post. On this particular Microsoft CRM environment – it proved to be more challenging. >Crm Exception: Message: Generic SQL error., ErrorCode: -2147204784, InnerException: Microsoft.Crm.CrmException: Generic SQL error. —> Microsoft.Crm.CrmException: Generic SQL error. —> System.Data.SqlClient.SqlException: The DELETE statement conflicted with the REFERENCE constraint “business_unit_queues”. The conflict occurred in database “CRM_MSCRM”, table “dbo.QueueBase”, column ‘BusinessUnitId’. 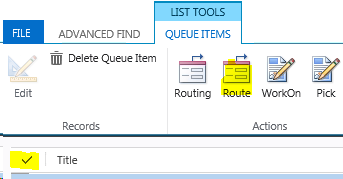 The Queues turned out to be “WIP Bin queues” which were from CRM 4.0 and earlier version designs and are NO longer relevant in CRM 2011 or later per this article. This makes sense since this Microsoft CRM environment was an upgrade from CRM 4.0 previously. We will need to first remove these associated WIP Bin queues first and then delete the Business Units (and their default Teams). What we did was setup a new Queue to store any Queue Items from the WIP Bin queues. I usually called this Queue “WIP Bin queue items” and then use the Queue Item’s Route function to route any existing WIP Bin queues’ items to our new Queue. After removing the associated WIP Bin queues items and then deleting the WIP Bin queues – we were able to successfully delete the Business Units which automatically delete the corresponding default Teams. Yay! Contact me if you need some Microsoft Dynamics 365 CRM Customer Engagement assistance. Workopia, Inc – Keeping up with the Cloud Innovations! This entry was posted in Advanced Find, CRM On Premise, Dynamics 365, Microsoft CRM, Microsoft Dynamics CRM, MS CRM, MS CRM 4.0, Troubleshooting and tagged Business Unit Delete, SQL Error, Team Delete, WIP Bin queue. Bookmark the permalink.